Renew your Artistic Licence, or: “Don’t Just Document – Design”. Every spring in Montreal we have a brief opportunity when it’s warm enough to be out drawing, but before the leaves come back on the trees. I try to make the most of this time – running around looking for views that will be obscured by foliage later. This sketch, (done back in April) is the Chateau Ramsay. The old Governor’s residence from 1705. 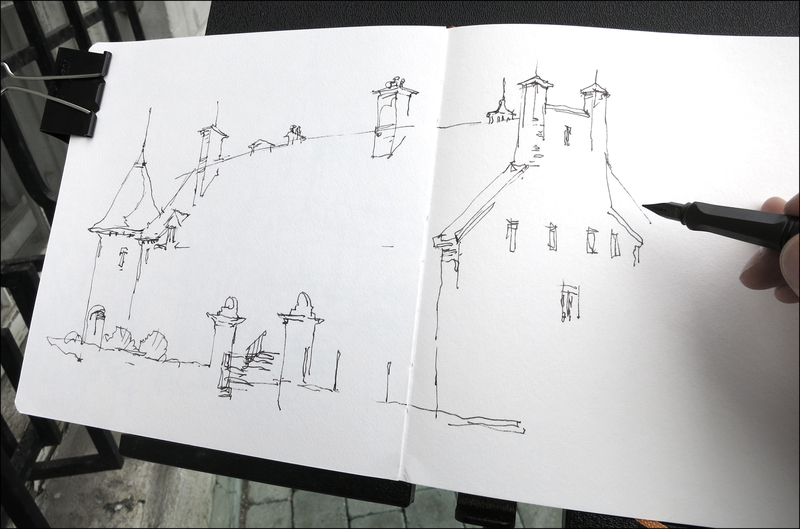 I drew this one leaning against our city hall, looking across the street to Jacques Cartier Square. The Chateau was the first building proclaimed as a historical monument in Quebec and is the province’s oldest private history museum. In the summer tours are given by docents in 18th century costumes. Bonus sketches! 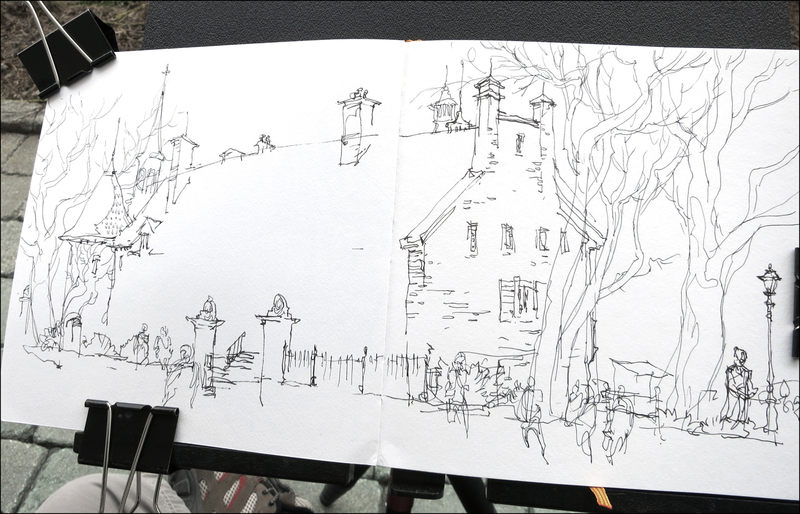 I went by the chateau on the weekend, as part Montreal’s World Wide Sketchcrawl #44 and drew the guards, and these pipers. They seemed to get a kick out of being sketched – despite being photographed about 100 times while I was there. I don’t suppose an artist comes by every day. The pipers asked me inside to get photocopies of the sketches. (I can report, the chateau’s office is not 100% historically accurate). These drawings might turn up on their team shirt later this summer. I’d like to use this sketch to talk about ‘artistic license’. Your special ability as an artist to alter reality to suit your needs. I feel we should be making a conscious effort to compose what we see. We are free to edit out unimportant or distracting details. A great storyteller never lets facts get in the way of the truth. One of the big advantages of drawing on location is that you can move around the subject. It’s the reason I often sketch standing. You only need to shift a foot to the left to change your view angle enough to understand what’s blocked by a tree. You’re not a camera – locked into a point of view. And, unlike a plein air painter, you don’t have a big easel pinning you in place. (Ok, in fact I do have an easel, but I use a light-weight camera tripod I can pick up and walk with). In this case I have made some significant changes from reality. Can you ‘spot the differences’? I’ve cut down a big tree, pushed another one behind the tower, lowered the fence posts, and removed a complicated lamp post as well as a bunch of ugly signs. This is all in order to sketch an unobstructed view of the front elevation. I’ve also completely ignored the correct number of windows and dormers. And of course I’ve left out the neighboring buildings. Plus I frequently do this unconscious thing – ‘slimming’ the building, sketching it a little taller, a little more elegant than it really is. And of course – I am using color to selectively guide your attention. The principle I call ‘Gradient of Interest‘ at work. This is all stuff that just happens without planning. It’s built into my eye-brain-hand circuit. These errors (or improvements, depending on your taste) just happen naturally. In fact, I’m *trying* to be as accurate as possible. But I’m not willing to slow down the energy of the drawing in order to be perfect. I’m going for the feeling of the building, not the architect’s rendering. (Nothing against architects! Some of my best friends and all that). I hope you’ll be encouraged to take some artistic license with your own sketching. Just have fun with it. Concentrate on what a place feels like, the impression, the atmosphere, and it will come through in the sketch. OK – I’m going long here – so I’ll wrap up with some progress steps, showing what I call ‘Drawing from the Outside In’. (Lots about this in my upcoming book ). It’s just a matter of getting the outside ‘box’ first, then filling all the details inside the box you’ve made. Great, thanks…….this is exactly what I wanted to see about drawing from the outside in. Fabulous Marc, I can’t wait until my copy of the book arrives. I really hope that you decided to take my friend Patrick Mahoney up on his offer to teach for his company. I have taught for him in Cortona twice, Santorini, Cinque Terre, and this past May in Positano. Every trip was a blast, well organized and executed with scenes to die for. I will be the first to enroll if you decide to teach for Patrick. Nice feel to your sketching. A book? Wow. So looking forward to it! Thanks for the encouragements to use the artistic licence! Your rendering of the building is so elegant, romantic, uplifting…I am definitely inspired to gently twist the reality in a similar way! This has been so good for me to read – I’m rather a perfectionist and and when I’m location drawing I get so caught up in the details of a sketch, and how identical it is to what I’m seeing in front of me, that it just turns into a bit of a stress-fest when I realise that my drawing isn’t a 100% accurate representation….! I’m still just a learning illustration student at the moment but your posts are always helping me out. Thank you for so generously sharing your knowledge. Those step-by-step images are terrific! Really great post, Marc! As an architect (who is never offended by your cracks ;)) this is particularly helpful. I’m *good* at drawing buildings, and so I find myself wasting time on details and proportion, while overlooking the spirit of the scene. 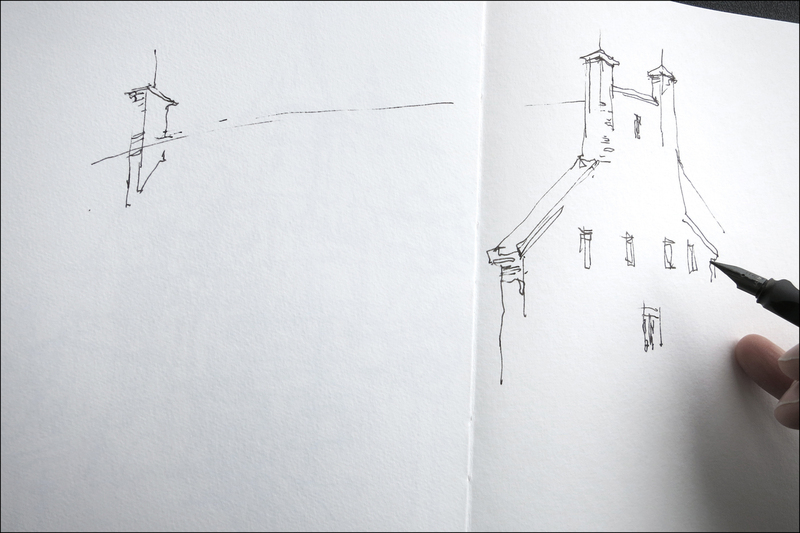 As the instruction of hand sketching has declined in architectural education, there are more of us who have a less confident hand when we sketch. One of the things I’ve liked most about getting back into regular sketching is the increased freedom it allows me as a designer. Thanks for sharing this, an I’m really looking forward to your book! From a “backwater ” on Carr Inlet, Puget Sound, Washington State, here in the tiny community of Lakebay , I think the essence of the subject can be gleaned only with intimate knowledge of it obtained by multiple iterations and understanding acquired through real-time , on-site sketchings. Your polished skills are impressive as they are evidenced in what you do! I particularly love the lively sketches of the pipers. Nice one. Marc…thanks for the reminder about artistic license. It’s almost painful for me to see a “timid” sketch, which shouts the concentration of trying to “get it right” but lacks the artist’s personality. Most of the time that less is more (I’m speaking to myself here), so that our brains can have the fun of “finishing” the painting. Your sketches reflect what I always say: a fresh and lively sketch with watercolor loosely applied, results in a subject which looks better in the painting than it does in real life! I think the reason for that is that in the painting, the artist’s interpretation is presented….as unique as each person’s handwriting. The skill of knowing what to leave out comes only with lots of practice. Love your posts! Thanks for sharing. I’m learning tons from you.